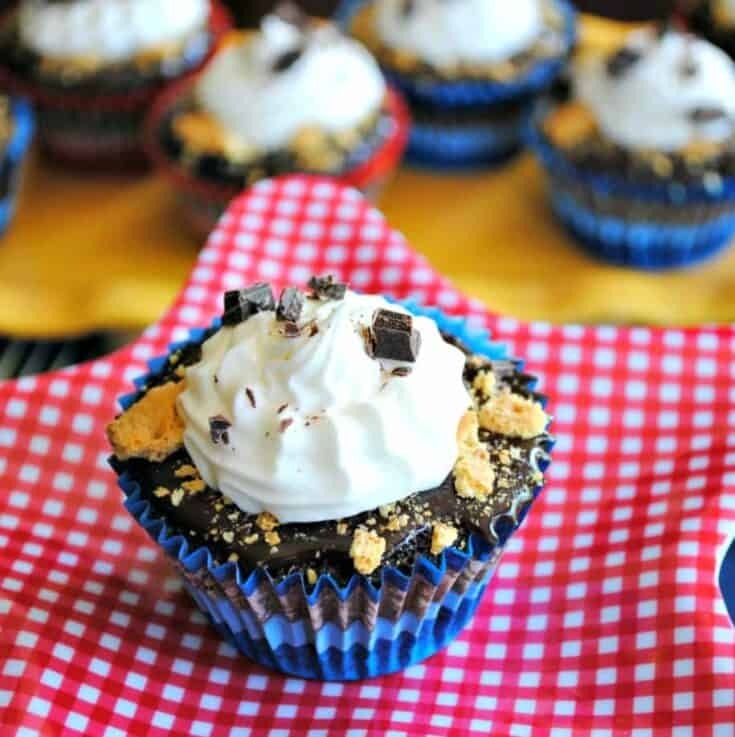 S’mores Cupcakes: rich, fudgy chocolate cupcakes with chocolate ganache, marshmallow frosting and graham cracker crumbs for the perfect indoor s’mores treat! So, I bought a kitchen blow torch. I had every intention of torching the tops of these cupcakes. But I’m home alone. And I got scared. No, true story. I have a fear of fire, and since I have no idea how to fill the torch with the butane, much less USE the torch, I put it aside and took photos anyway. This is why camping is more fun WITHOUT s’mores. Okay fine, go call the camping police on me. I prefer to accidentally forget the marshmallows at home. I’ve said it before on this blog, and I’ll say it again…I hate cooking s’mores over an open fire with my 4 children. Besides the fact that they are a gooey disaster, I end up having to cook them myself because the kids marshmallows conveniently go up in flames EVERY TIME…or how about the fact that when they do finally get a good marshmallow perfectly browned, it falls in the dirt with a child erupting in tears. But these cupcakes? No tears involved. Just the sweet goodness of indoor s’mores in a disposable wrapper. Dark chocolate cupcakes dipped in chocolate ganache, sprinkled with graham crackers and topped with marshmallow frosting. Start by making the delicious chocolate cupcake base. Preheat oven to 350 degrees F. Line cupcake tin with your favorite liners! In a bowl, combine flour, cocoa powder, salt, baking soda, and baking powder. Set it aside. In a mixing bowl, beat softened butter and sugar for 5 minutes. Add eggs, one at a time. Slowly add in dry ingredients, alternating with coffee (about 3 additions of each). Spoon batter into cupcake liners, about 1/2-2/3 full. Bake for 15-20 minutes, then remove and cool completely. Melt chocolate with heavy cream in a double boiler until smooth. Spoon ganache over cooled cupcakes, and immediately sprinkle with crushed graham crackers. Set aside to set. For the frosting, beat butter with marshmallow cream, powdered sugar, and heavy cream for 3-5 minutes, scraping down the sides of the bowl as needed. Add more cream to get desired consistency, if needed. To frost, fill decorator bag and pipe onto cupcakes. Sprinkle immediately with chopped chocolate. Enjoy. Can I substitute anything for the coffee? The coffee does not flavor the cupcakes at all, but it does bring out the richness in the chocolate. If desired, use water instead of coffee. As someone who loves indoor S’mores, here are some of my favorites! Summertime means frozen desserts! My family love this S’mores Coffee Milkshake for an afternoon treat! 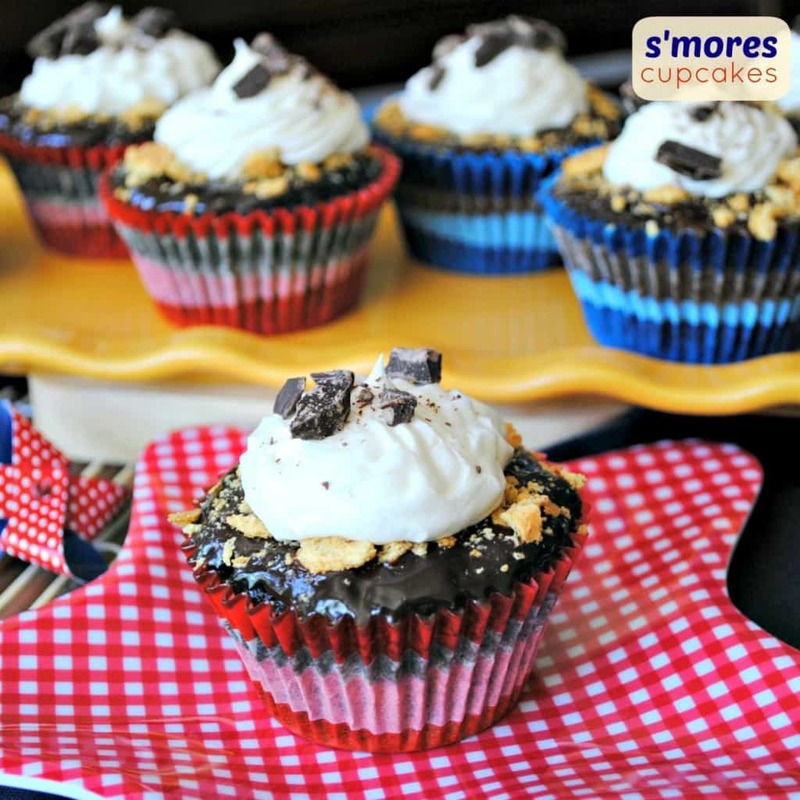 S'mores Cupcakes: rich, fudgy chocolate cupcakes with chocolate ganache, marshmallow frosting and graham cracker crumbs for the perfect indoor s'mores treat! In mixer, beat butter and sugar for 5 minutes. Add eggs, one at a time. Slowly add in dry ingredients alternating with coffee mixture (about 3 additions of each). Pour batter into cupcake liners, about 1/2 full. Bake in a 350 degree oven for 15-20 minutes. Remove and cool. For ganache, melt chocolate with cream in double boiler until smooth. Spoon ganache over cooled cupcakes, sprinkle immediately with crushed graham crackers. Set aside. To make frosting, beat butter with marshmallow cream, powdered sugar and heavy cream for 3-5 minutes, until fluffy. Add more heavy cream if necessary to get desired consistency. To frost cupcakes, fill decorator bag and pipe onto cupcakes. Sprinkle immediately with chopped chocolate. ENJOY! I literally just left Shelly’s site and saw her cupcakes. Now yours! The Universe wants me to make these!! I love that you didn’t wait for someone to come help you with the torch! I am totally like that– always so impatient to photograph and post!! I think it’s a blogger’s high that we get addicted to or something. And you just can’t wait to get that next fix! Weird to compare blogging to drugs?? I am so afraid of fire too – I would have done the same thing! These look SO good! There is no way I would have tried to use the torch with no one home either!!! But then I would roast marshmallows over a fire…love the crunchy coating they get. Yum!!! Yum girl, they look so wonderful. I’m not a s’mores fan, but your cupcake version definitely is right down my alley.. I don’t allow myself to buy marshmallows or graham crackers anymore. I ALWAYS have chocolate chips, so the combination of the 3 means I’m gonna go up a jeans size. Ganache AND frosting??? You’re killing me! Oh-My-Goodness! 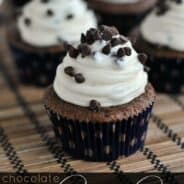 These look soo tasty and tempting:) I am in a cupcaking mood, so I am pinning these for later. I will definitely be making these. Thanks for sharing! Mmm what a fabulous idea! Love it! Eep. I’m afraid of using a torch as well. These Cupcakes sound perfect!! How fun, I love blow torches! 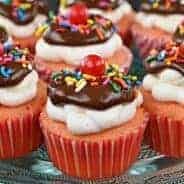 Great cupcake recipe! You have no idea how badly I want to CRAM one of these in to my mouth!! YUM! These look so yummy!! I’m a smores addict!! How funny! I did S’more Cupcakes this week too!! 🙂 I love your version! Found you at A Glimpse Inside! I really love your cupcake idea. I haven’t come across this yet. I love s’mores…and I love cupcakes. Together they must be amazing. I’m so glad you joined in at Whimsy Wednesdays. I tweeted about these. If you get a chance stop on over to join in the bloglovin blog hop that I’m hosting right now. You had me at s’mores…found you through sweets for a saturday…thanks for sharing! These cupcakes look incredible! I love s’mores, and I can’t wait to make these! Question… do you think you could get the roasted effect on the marshmallows by sticking them under the broiler for a minute or two? Or do you think that would end up burning them marshmallow and/or cupcake? I love any S’more but I love them with the marshmallow toasted even more! A good recipe for beginners.